Matt & I have a saying around our house that if one of us is grumpy then we are a Grumpasaurus. 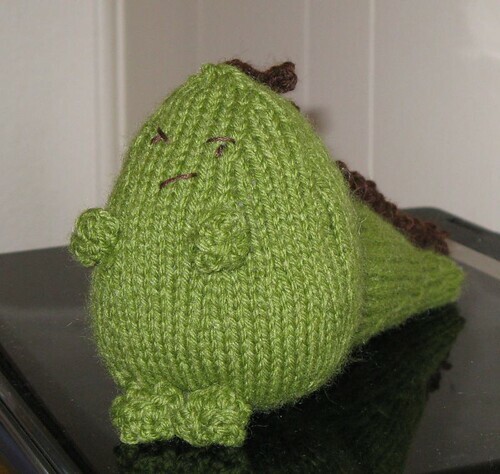 I’d been batting around the idea for awhile of knitting him up a toy version of the Grumpasaur & came up with this little guy. I thought he was cute enough to share with all of you. This was supposed to be a stocking stuffer for Christmas & then a Valentine’s Day gift but I actually just finished it yesterday. I had to keep starting over to get the shapes I wanted for the body & the tail. Of, course you don’t have to make your dinosaur grumpy, have fun embroidering any expression you want. He’s also pretty darn cute without the comb. Using lighter green cast on 6 stitches. Divide equally on 3 needles. Join together being careful not to twist. Place a marker between your first & last stitch to mark rows. Pull your cast on tail inside & weave it in. Embroider the face on to the front (The front it the area between the last ssk & the first k2tog. The back is the 6 stitches that have been knit even.). Start stuffing the body, stuff it pretty tight to get the shape you want. 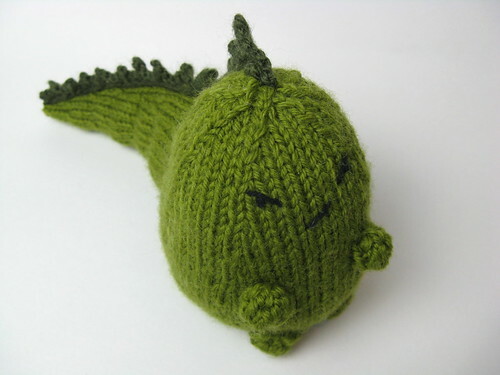 With lighter green cast on 34 stitches leaving a 15-inch tail. Divide equally on 3 needles. Join together being careful not to twist. Place a marker between your first & last stitch to mark rows. At this point sew the tail on to the back of the body with the cast on tail. I lined the 6 stitches between the last ssk & first k2tog up with the 6 stitches down the back of the body. 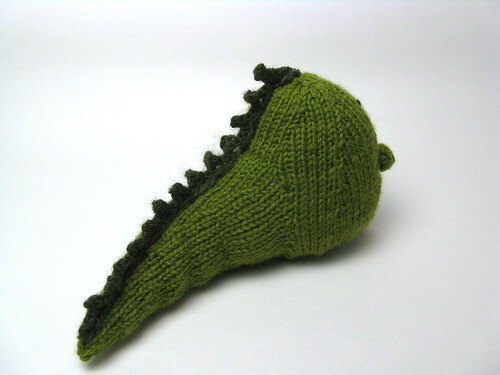 Start stuffing the tail & continue stuffing it as you knit it. Add any additional stuffing you need. Cut yarn leaving about an 8-inch tail. Thread tail onto a tapestry needle & thread through the 5 stitches on the needles. Pull tight & weave in the end. Using lighter green cast on 4 stitches leaving a 6-inch tail. Cut the yarn leaving a 6-inch tail. Thread onto a tapestry needle & thread through the 4 stitches on the needle. Put the cast on tail on a tapestry needle & weave it through the original cast on stitches. Tie the two tails together pulling tight to form a bobble. Sew on to the body using one of the tails. Using lighter green cast on 6 stitches leaving a 6-inch tail. Cut the yarn leaving a 6-inch tail. Thread onto a tapestry needle & thread through the 6 stitches on the needle. Put the cast on tail on a tapestry needle & weave it through the original cast on stitches. Tie the two tails together pulling tight to form a bobble. Sew on to the body using one of the tails. Put the right needle between the first & second stitch on the left needle, wrap the yarn around & pull through creating 1 stitch. Place the new stitch on the left needle. 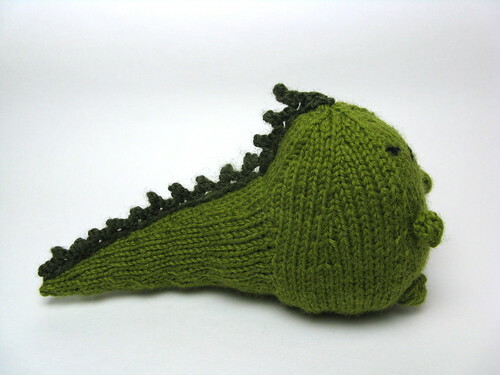 With darker green cast on 30 stitches leaving a 15-inch tail. Cut a 6-inch tail & pull through the last stitch. Use the tail from the cast on to sew the comb along the back of the body & the top of the tail. Weave in bind off tail. Please do not sell my pattern, claim it as your own, reprint it or teach it in a store without contacting me. You may link to it from your blog or site. If you find any problems with this pattern please let me know. Also if you make one I’d love to see it. ****Update 1/25/10 The problem with the row numbering has been fixed. 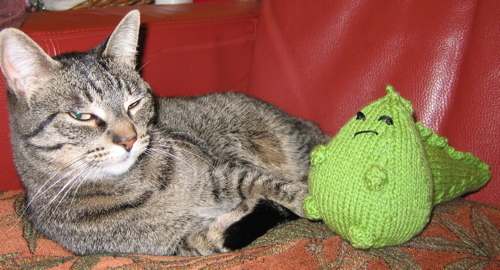 10 years ago by Kat in Knitting , Knitting Projects , Needlecraft , Projects | You can follow any responses to this entry through the RSS feed. You can leave a response, or trackback from your own site. I HAVE to make one of these to have on hand when one of my darlings are in a bad mood. (With the 15 year old, it seems almost everyday, *sigh*). That way, I don’t have to say a word – just hand them the Grumpasaurus. Maybe, just maybe, that would put a smile on their face…it did on mine! Adorable, Kat! I know a few people I could make this for!!! Hee, hee! Great to see him all finished. So cute! Thanks for sharing the pattern. i’ve always referred to cranky folks around me as ‘grumpasaurus rex’! this is a perfect gift for so many people I know! super cute. mn? i recently moved to st. paul from texas… brrrr. Very cute. He would have to be a crankasaur @ ourhouse. This is SO fabulous! I love his little face! Thanks so much for sharing the pattern, I’ll be linking to this little guy. I will try to crochet( or give up and have my knitting 16 yr old do it) one of these! I have 5 daughters and someone is always having an off day, I plan to have them come get the grumpasaurus to set on there bed to tell me ” I am having a bad day” so I can give them extra space and patience. this is wonderful! Love the pattern. We also say someone is being a grumpasaurus. If they are in a particularly nasty mood, they are a Grumpasaurus Rex. After being called a grumpasaurus by several family members, my (then about 8, now 14yo) son went to the dress up box and came back with a stegasaurus costume on. Cracked everyone up. This is awesome. I have a little nephew who wants to be a paleontologist, and this would make a cute gift for him. haha! I love that little face, so grumpy-pants! Wow! I need one! Thanks for the pattern! The minute I saw him. I knew I had to have one of my own. I’ve been using the term “grumpasaurus” on pets, friends, husbands, etc, forever! It’s so awesome that you actually made one! A perfect representation, IMO. It was really easy and your directions were awesome! I *love* the grumpasaurus! Some time ago my fiance referred to himself as a Crazy Roasaurus – his abbreviated name is Ro – in reference to a particularly playful mood he was in. 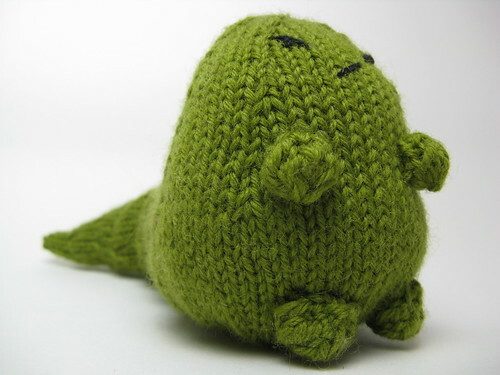 I am thinking of knitting him one of these with a whole different expression! Great pattern! Gotta make this one for my niece. This is really nice. and i like the color green. This is adorable, and since toy-stuffing only comes in huge bags I have an excuse to make one for everyone I know! it's so green. i love it! I found this pattern through Ravelry, and wanted to say thanks so much for sharing it, might be my favourite thing I've ever knitted! I@ve made three so far (two are here http://apologyforanidler.blogspot.com/2010/04/grumpasauri.html , the second one turned out a bit better) and have requests for two more. Thanks again! i seriously have been trying to make the comb for it and cant get it. is there anyway you can help?? Grumpasaurus is sooooo cute! thanks so much for sharing! 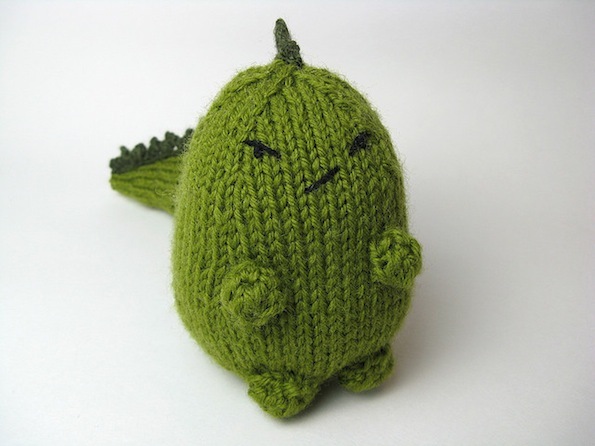 I dont Knit :[ But i really really want a grumpasaurus! If anyone sold one on ebay or directly to me, I would definitely buy him. Thank you for the pattern, though. Aww! Thanks for the pattern! I am thinking about giving my best friend one for christmas. She would LOVE it, and I think it would be alot of fun to knit! He is so cute. My bf and I call eat other grumpasaurs when the other is grumpy so this is quite funny! I think this pattern is absolutely adorable and I actually just finished the body and am starting on the tail. I find it funny your sewed the tail on instead of picking up the stitches. But so far the pattern is really easy and rather enjoyable to work. SpaghettiStockings – You know I think I did it that way for a couple of reasons. 1. I was making the pattern up as a wrote it & wasn't exactly sure how the tail was going to fit so I made it was it was easier for me to do separately. 2. I attached the tail to the body with the top of it really spread out & it was easier for me to see how it would look once made rather than imagine it from picking up stitches. There is no reason you couldn't do it by picking up the stitches though. Just make sure you have them spaced right around the back of the body so it looks like it comes off of it gracefully. hi i would love to make some of your free patterns for gifts, however, when i get on the pattern page there is no icon anywhere not even in the toolbar to print. is anyone else having this problem? i am not very knowledgeable as far as the computer goes. can anyone help? Wow, I’ve never heard of there not being a print choice in your browser toolbar. I just went and tested it in Goggle Crome, Safari & Firefox with no problem. The print option was under File in the toolbar of each. Wish I could be of more help. yeh i solved the problem. i am so happy. keep the wonderful patterns coming. Those are TOO CUTE! I saw Chick’s little grumpasaurus on loveandleash.com, and it was adorable! Great work! Aaaahhhh! His little fists! And his face!! I don’t knit, but I’ll have to try him in felt. So cute & thank you for sharing. Pingback: Grumpasaurus Soon to Rampage!